Marinated Tomatoes – great for your skin! ♥ Lycopene also makes skin less sensitive to UV light damage, a major culprit of fine lines and wrinkles! ♥ Tomatoes can also keep your blood sugar in balance, and high blood sugar increases the signs of aging. Did you know that diabetics tend to look on average 2 years older than their actual age? Fellas, don’t want to leave you out! Lycopene can reduce cancer risk, including the most common cancer for men, that of the prostate. There are several other benefits to be enjoyed from eating tomatoes, but let’s get to the point here – a great recipe to encourage you to eat more of them! Beautiful, bright and full of flavour! ♥ Roughly chop the parsley, and cut the basil in to chiffonade. Do this by rolling up all the leaves together, and slicing then thinly. Mix all of the marinade mixture together. ♥ Slice the tomatoes thickly, and the cherry tomatoes some lengthwise and some cross-section – it looks better when you mix it up a bit 🙂 Place them in a flat dish, then pour the marinade on top, tossing to make sure to coat all the tomato pieces. ♥ Cover and marinade in the fridge for 3-4 hours. 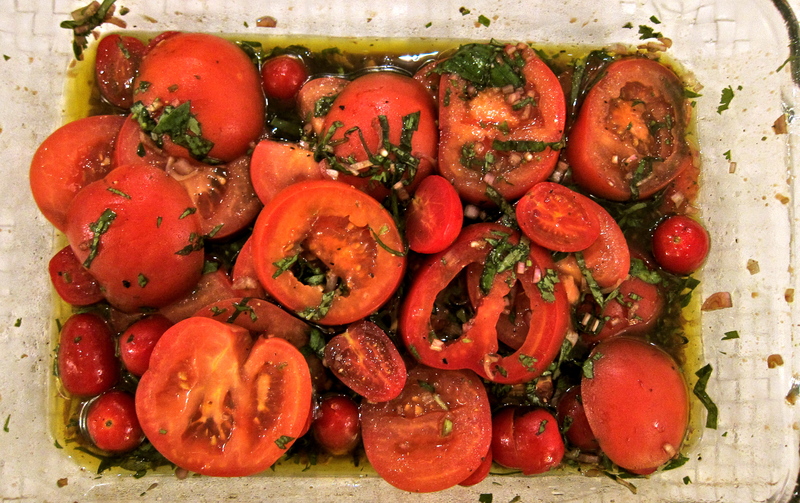 The tomatoes will sweat some of their juices, making a glorious sauce that can be mopped up with a piece of bread! I made this as a side dish, together with a simple salad of butter lettuce and avocado with a Honey Dijon Dressing, to accompany BBQ Butterflied (boneless) Lamb Leg – it was heavenly!